Check the Fien Print: NetflixWatch: "13 Tzameti"
In a Nutshell: One of the toasts of the 2006 Sundance Film Festival (it won the juried World Cinema prize), "13 Tzameti" never got much of a theatrical release and after finally catching up with it, I can tell why. It's a movie for audiences who like their French films gritty, their story-telling padded and their irony simplistic. In short, it's the perfect movie for uninquisitive geeks and, apparently, IMDB messageboard posters (Yes, I understand that there's a wee bit of overlap there). "13 Tzameti" is Gela Babluani's feature directing debut, but although its running time is only 90 minutes, the film could be cut to 17 minutes tomorrow without losing a bit of character dimension, plot complexity or overall nuance. At either length, it's a one-sick-joke movie: Poor people (immigrants, in particular) in France are so desperate that they'd engage in death games to free their families from debt, while the rich are so desensitized to their plight and so callous that they'd treat those death games like modern gladiatorial combat or reality TV, as a spectator sport or another way to make money. That's pretty shocking stuff if you haven't seen "Battle Royale," or "They Shoot Horses, Don't They?" or "Running Man" or "10th Victim" or "Series 7" or any of the literally dozens of films, books and TV shows that have mined very similar territory with a more complicated social compass. 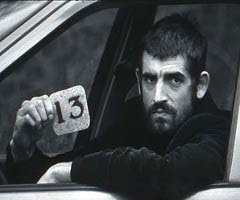 "13 Tzameti" is like "La Haine" with more plot contrivance, less filmmaking savvy and less intelligence. So actually it's nothing like "La Haine" except that it's in artsy black-and-white. There's an undeniable tension to "13 Tzameti," though it's caused by two things, the tension and Babluani's noticeable amateurism as a filmmaker. Russian Roulette is tense stuff, duh. If people are pointing guns at each other, yelling and then firing, that's going to generate a certain amount of audience concern, even if it's impossible to care about any of the characters (the leading man, George Babluani, is without craft or affect as an actor, which I found distancing rather than intriguing). Nothing the director does enhances that tension, quite the opposite. The movie is clumsily directed, with black-and-white photography serving as an artificial proxy for real moodiness. That there are no characters isn't worth criticizing. The generic anonymity of the piece is supposed to be part of its charm. At that point, then, why isn't the ostensible hero killed 45 minutes in? That would be the truly subversive approach, to go full-on "Psycho" and relieve the audience of the cardboard cut-out they've been tolerating for the first act and just go on to alternative players in the game, maybe find an interesting one. And as for the ending [which I'm gonna spoil here...], it's dark in the most predictable of ways and in a way that has no connection to the rest of the film. The "widowed" brother shoots him? Yawn. I guess that saved Babluani the trouble of thinking about a better ending. A *truly* nihilistic and bleak ending would have had the brother sitting down next to our "hero" on the train, pointing the gun at him and saying "There's another game starting tomorrow. Are you ready to play again... Brother?" The Day No Pigs Would Die on "Idol"